This is a new approach to exploration of movement and stress adaptation in combat preparation. Its emphasis on biomechanical principles and dissolution of tension density allow for the application of Softwork principles to any form of martial training while providing a complete method of practice in itself. This manual lays out the theory and practical application of Softwork. A handy reference for combat enthusiasts, it provides a conceptual framework for understanding the roles and goals of Softwork in your martial pratice. The Three Approaches to Martial Arts and the Neuroendochrine Response. This lecture and demonstration, presented at the first Softwork seminar, bridges the gap between theory and practice. Using R. Buckminster Fuller's Tensegrity Model as an example, Coach Scott Sonnon explains how the integration and exploration of breath, structure and movement can unlock undeveloped potential. 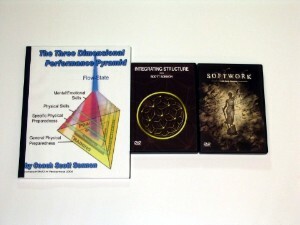 This groundbreaking 2-DVD set shows Softwork in action. Practical explanation of key concepts is accompanied by unrehearsed demonstration of applications in striking, standing grappling, ground fighting, weapons, multiple attacker practice and more. "Like the center of the place that all techniques come from," the concepts and principles demonstrated may be explored in many ways regardless of your fighting style. This complete Softwork Package is recommended for serious practitioners.